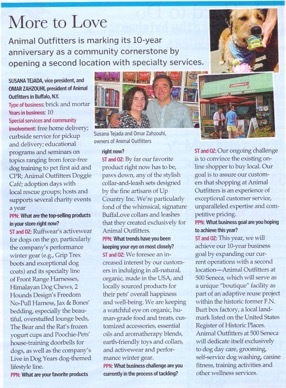 Due to our exceptional customer service, unparalleled expertise, and competitive pricing, Animal Outfitters was recently featured in the December 2015 issue of Pet Product News – the leading monthly business news magazine that informs, educates and entertains the international professional pet industry. The title of the article says it all—there’s more to love at Animal Outfitters. We love our customers and, in turn, we love your canine and feline best friends as if they were our own. Stop in and feel the Animal Outfitters difference—where we treat everyone just like family!